Fire for Effect Studios has their big 50% off "back to school sale" coming to an end tomorrow. Go register for your classes now. Learn the fundamentals of sculpting at 50% off! 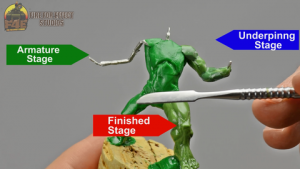 Designed with the miniature painter, modeler, converter and sculptor in mind, these courses are complete guides to sculpting with HD videos, pdf guides, exercises, and teacher guidance. Our back to school sale ends September 30th so don't miss out on the sale!